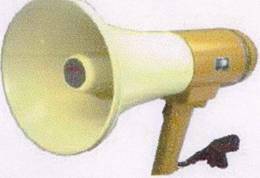 The A 1982 alert/evac megaphone operates in the same way as a standard megaphone. and is activated by depressing the trigger of the megaphone. The tone remains activated until the trigger is released. powered by a plug pack (batteries sold separately).